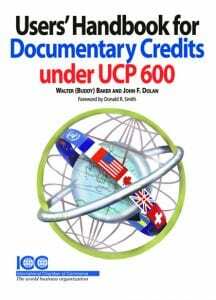 Users’ Handbook for Documentary Credits under UCP 600 is designed to serve as an introduction to users of documentary credits, that is, to sellers and buyers who seek to increase their access to cross-border markets. It strives to demonstrate the way commercial parties and bankers have used this remarkable commercial device, the documentary credit, to achieve their objectives. Part One is a brief discussion of international sales and transport. Part Two explains the banking industry’s crucial role in documentary credit transactions and illustrates many of the transactions in which commercial parties utilize the documentary credit. Part Three explains the way documents control the payment function of the documentary credit. Part Four introduces the all-important feature of the documentary credit – the ways it opens financing options to sellers, which can then extend credit to buyers. Part Five introduces the standby credit and illustrates its role in cross-border transactions. Users’ Handbook also contains a handy glossary of international trade terms for easy reference. Order your copy now at Amazon. ISBP is the best reference book in banking practices for international letters of credit documents subject to UCP 600. Use of ISBP has significantly reduced international discrepancies for documentary credits and is regularly used by banking, logistics, insurance, legal and corporate professionals and academics worldwide. It is a great companion book with UCP 600. The latest in a series of best-selling books, INCOTERM® 2010 Q&A. This publication brings together expert guidance and practical tools to enable readers to use the Incoterms® rules to their strategic advantage. Helping users understand and benefit from ICC’s world-famous Incoterms® rules. A practical “one-stop shop” for traders and those who advise them, Incoterms® 2010 Q&A can help avoid mistakes arising from dangerous inconsistencies between the contract of sale and related documents, such as letters of credit and contracts of carriage. Commercial letters of credit are the lifeblood of the international trade system and, for more than 70 years, the International Chamber of Commerce (ICC) has established the rules governing documentary credits worldwide. By a unanimous vote of 91 to 0, the ICC Banking Commission on October 25, 2006 approved UCP 600, ICC’s revised rules on documentary credits and how to use a letter of credit. UCP 600 entered into force on July 1, 2007 and contains substantive changes to the existing rules that all international business professionals need to know. Re-drafted transport articles aimed at resolving confusion over the identification of carriers and agents. The new UCP 600 also contains within the text the 12 articles of the eUCP, ICC’s supplement to the UCP governing presentation of documents in electronic or part-electronic form. Are you studying the latest international commercial trade terms (Incoterms®)? With the 2011 update to the previous terms for transporting goods abroad, it is imperative to stay on top of the most recent changes. Save yourself the time and trouble looking up the terms in the Incoterms® 2010 manual and get your very own Incoterms® 2010 chart to display on the wall in your office for quick reference. This practical wallchart explains all 11 Incoterms® 2010 rules at a glance, including thorough explanations of cost allocation, points of risk transfer, responsibility for delivery and clarification of steps where mutual cost allocation and responsibility take place. The chart also further breaks down all of the terms into two specific groups: those that are exclusively applicable to marine transport and those that are applicable to all methods of transport. It is ideal for offices, classrooms or as a client gift. 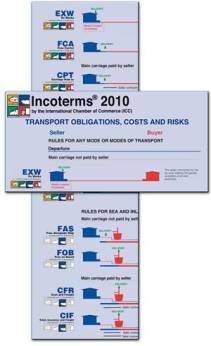 Are you interested in purchasing Incoterms® 2010 charts in bulk to give as a corporate gift? Personalization is available for this item. We can add a company or school logo to the chart. Personalized charts must be purchased in a minimum quantity of 30 packs (300 charts).